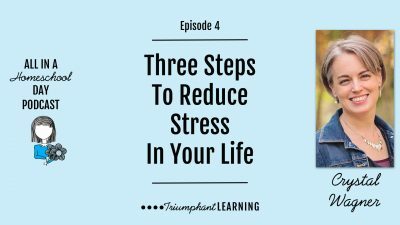 Learning how to eliminate, automate, and delegate your responsibilities can reduce your stress and help you accomplish more each day. This is important as a homeschool mom with many demands on your time. In this episode, we will explore what you can eliminate, automate, and delegate as a household manager and homeschool teacher. How much time does it require to homeschool your children? Here’s a breakdown of how much time I spend planning our Charlotte Mason homeschool. It is easy to be so focused on taking the next step that you forget to look up and make sure you are still on the right path. Here’s a look at why it’s important to evaluate your journey on the homeschool path and how to avoid some dangers of not seeing the big picture. Want in on a little secret? We didn’t finish all the school books this year…and it’s okay! You don’t have to finish all of the books you start. The value is not always in reading everything in the book, but in connecting with the material you do read. Homeschool teacher workdays are an important aspect of your homeschool planning. Don’t neglect this time to evaluate the past and look toward the future. The planning process can be overwhelming. The key to simplify homeschool planning is to break the planning process down into small enough pieces so you can focus on the next task instead of being overwhelmed. Here’s the process I use to plan our homeschool year. I’ve tried to be a paper planner. I saw all of the cute planners out there for personal and homeschool planning and want to use one. And yet, I kept going back to my electronic planners. I have found though that I am not a purist in either camp. Here’s my experience with electronic and paper planners and how I found that a combination of the two works best for us. There are just some days you wish you had a reset button for everyone in the house. I’ve found that taking breaks can often be just that button for us. 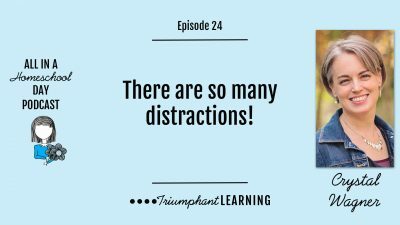 In today’s episode of the Triumphant Minute, I’m talking about the importance of scheduling breaks in your homeschool and how you can make that happen. Mind maps helped me see the big picture and how different subjects are related. It also allowed me to think outside the box and remember that not all learning is academic. Learn how to use mind maps in your homeschool planning. Learn three ways to create a reading log in Homeschool Planet. Includes a video tutorial.